Insomnia can affect your body in a number of ways. You may still feel exhausted when you wake up each morning. It can destroy any energy you may have and impact your work or school performance. Ultimately, it leads to a poor quality of life. Chronic insomnia can have a negative effect on your mind and body, like fatigue, memory loss, and issues retaining information. It can also impact your skin in ways you may not realize. Here are some ways that chronic insomnia can negatively affect your skin and what you can to do to improve your sleep and maintain skin health. The term “beauty sleep” isn’t just an expression. Sleep is actually very important to your skin health. When you sleep, your skin works hard to refresh, heal, and rejuvenate itself from the day. Because your skin is on alert all day to protect itself, it starts to wear down around the same time you do each night before you decide to go to bed. During sleep, your skin works to repair cells, tissues, and build collagen. Your skin will also absorb any nighttime skin products and serums more easily while sleeping. This skin refreshing process is disrupted when you do not get enough sleep or when you wake up frequently throughout the night. This causes you to wake up in the morning with a dull-looking complexion. You may also notice that dark circles and under-eye bags begin to appear. In addition, you may begin to notice fine lines due to the lack of collagen production. Collagen production gets interrupted when you aren’t sleeping well or for as long as you should each night. This causes the skin to begin losing some of its elasticity. A recent study was completed on 60 women between the ages of 30 and 49. Half of the women were not getting enough sleep, while the other half got enough rest per night. The half that did not get an adequate amount of sleep each night showed more defined signs of aging like fine lines, uneven skin tone, and looser, less taut skin. 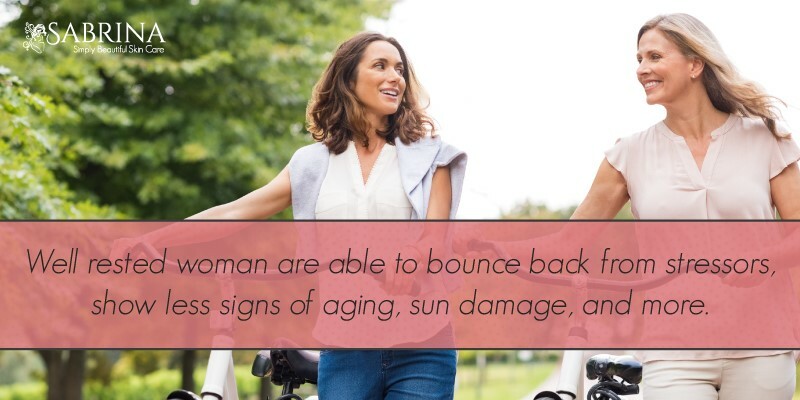 The other half showed that they were able to bounce back from stressors and showed less signs of aging. The study shows that poor sleep, or lack of sleep can speed up the aging process significantly. Your skin’s nightly refreshing process and collagen production are disrupted when you struggle with chronic insomnia. This causes signs of aging like wrinkles and fine lines to appear, making you look older than you may actually be. 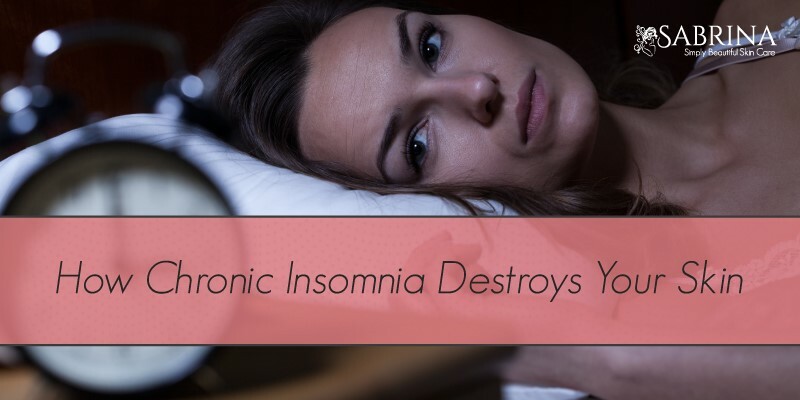 If you already struggle with psoriasis, eczema, and other inflammatory skin conditions, these conditions can be made worse through chronic insomnia. Because your skin is unable to heal and refresh itself when you don’t get enough sleep, the itching or burning sensation caused by these inflammatory skin conditions may become more agitated and difficult to treat. Speak with your dermatologist to see if lack of sleep is causing your existing skin condition to worsen. To maintain healthy skin and to keep your mind and body refreshed after a long day, there are a few things you could try to improve your sleep habits. First, get seven and eight hours of sleep per night. This allows your body, mind, and skin to properly renew themselves. Try to wake up and go to bed at the same time each night (even on weekends or days off). 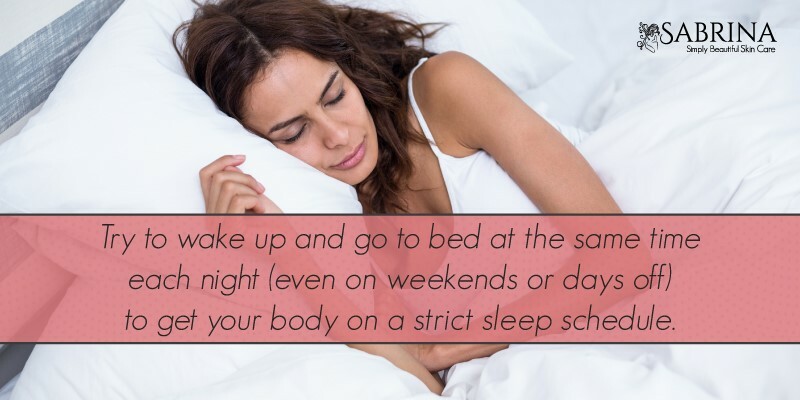 This gets your body on a strict sleep schedule. Exercising regularly and making healthy diet choices can also improve your body’s ability to wind down to sleep every night. Avoid drinking caffeine, eating large meals, drinking a large beverage, or drinking alcohol close to your bedtime. Finally, try making your bedroom a sleep-only environment. Avoid eating, watching television, working on your laptop, or doing anything besides sleeping in your bed. Before going to bed, listen to relaxing music, take a warm bath, or read a book to let yourself wind down. Concerned about those signs of aging that creep up via chronic insomnia? Using a quality anti-aging face cream can help fight off wrinkles and fine lines caused by chronic insomnia. The SABRINA Collagen Rx Plus Anti-Aging Face Cream may be the solution for you. This product softens skin and fine lines. In addition it also minimizes the appearance of pores and leaves your skin feeling soft, smooth, and healthy. If you still continue to have trouble with chronic insomnia, be sure to speak with your doctor for additional treatment options and solutions. Taking care of your sleep problems will get you back on track to living a happy, healthy, and restful life!